Powercruise Taupo 2009 was Powercruise 21 and this was the first year that the Powercruise event came to New Zealand from Australia. 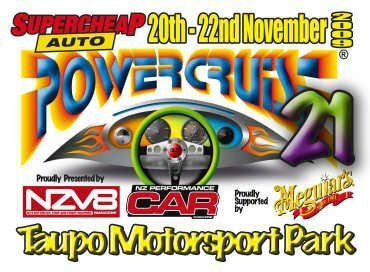 This was an absolutely awesome event and I encourage anyone interested in cars to come to the next one. There were heaps of nice muscle cars, drag cars, drift cars and just looking around the car park was better then going to any car show. The V8 guys did not like my number plate, "V8 KILR" which is not surprising I guess and there was quite a bit of laughter, sniggering and cheeky comments from the V8 supporters. One guys comment was "At a meet like this and a plate like that, it should read "SUICIDE", but all in all everyone got on very well. 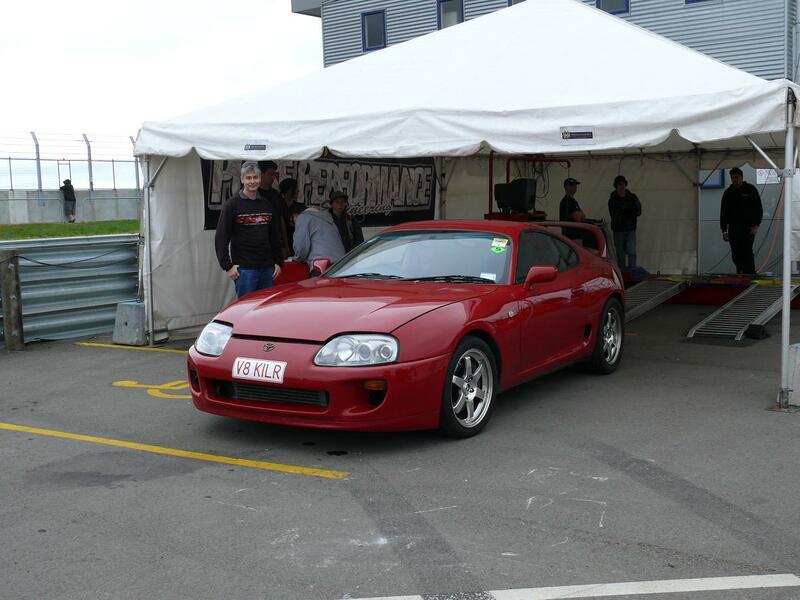 My Supra car is my daily driver and it was driven down to Taupo and then back home to Auckland after the racing was done. The off street racing was on the Sunday afternoon and it was not pure drag racing as you were not allowed to warm your tires up (by doing a burnout) and there was no sticky "track bite" on the track to give you more traction off the line. This was just like the illegal street racing where you just turn up and when the starter drops his hands you go for it. 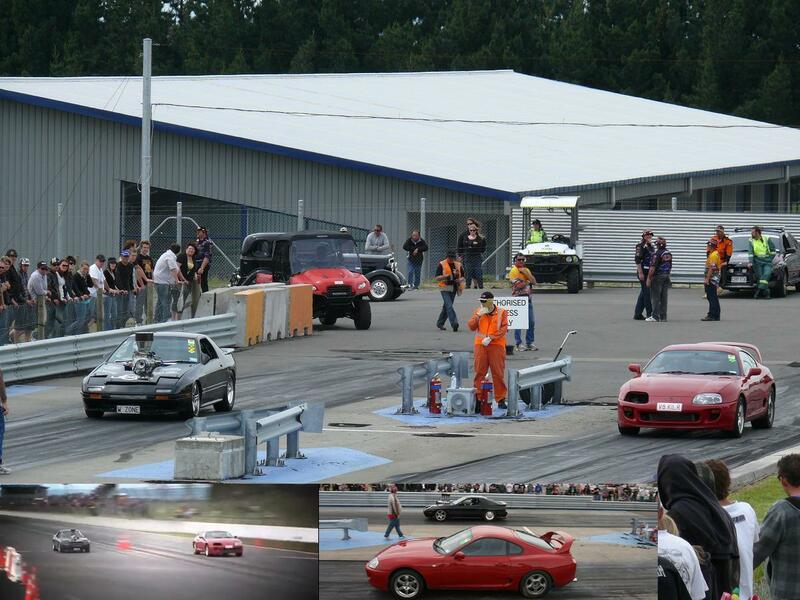 All cars needed a WOF and Rego, so this was true street racing at its best over a distance of around 200m. Round 1 off the off street racing against "YO3916", a 1989 Nissan Skyline 2L GTS-T. 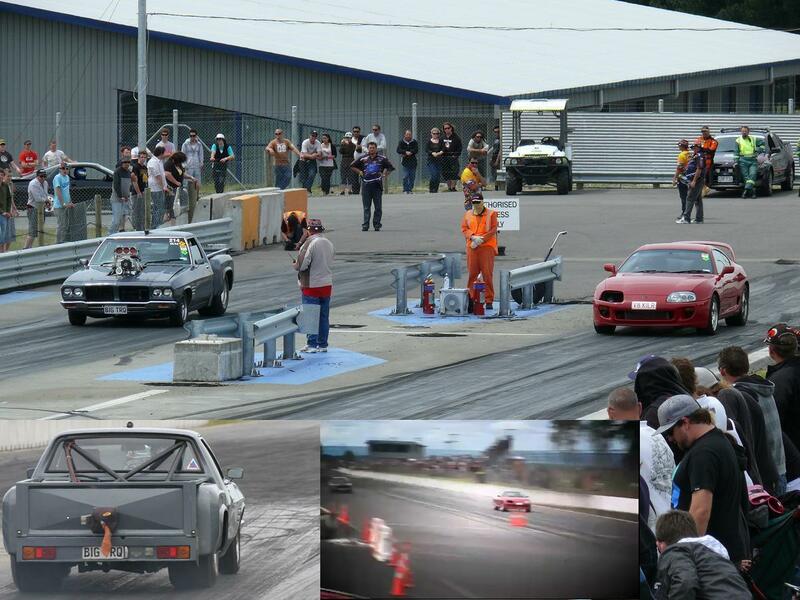 Round 2 of the off street racing against "DODGGE", a 1985 Mazda RX7 (ex Turbo) running a PP NA 13B engine. Round 3 of the off street racing against "MORG", a 1970 Chrysler Rambler Rebel (Ambassador) with a 500 Chrysler (8194 cc) supercharged V8. 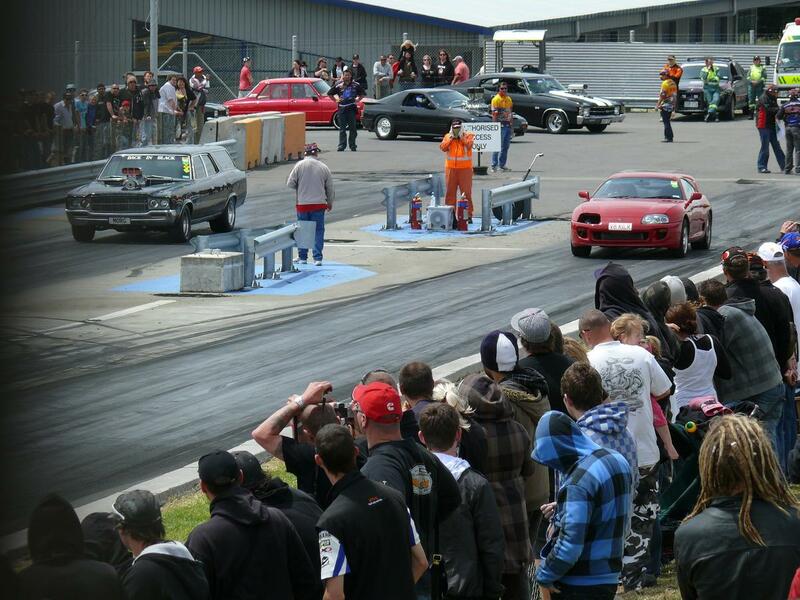 Round 4 of the off street racing against "BIG TRQ", a 1972 Holden Ute with a 540 CHEV (8849 cc) supercharged V8. 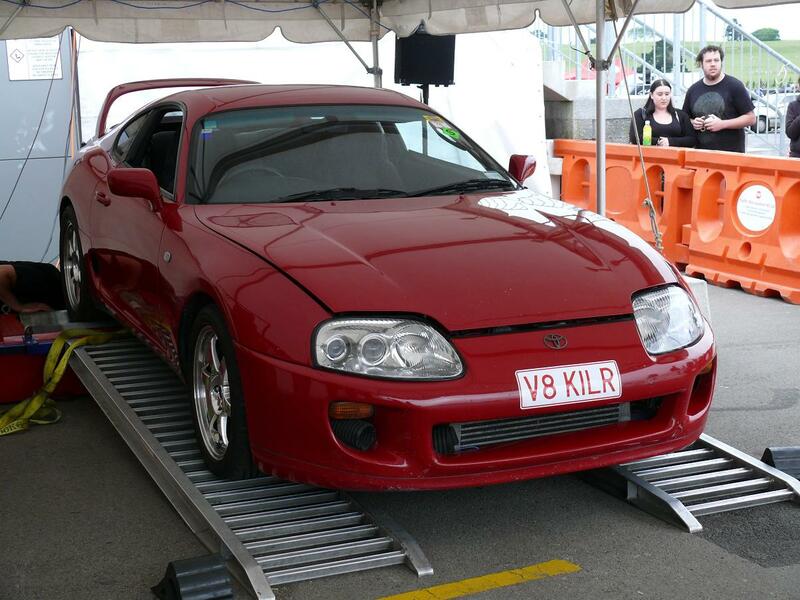 This V8 has made 630 rwkw on the dyno and has a parachute at the back which is only compulsory for 150 mph plus runs. See the inset picture at bottom left. A quick check on www.carjam.co.nz shows that this car has done zero km's in the last two years, so it is a dedicated drag car with no street time at all. He has previously run a 10.078 at 132 mph at Mere Mere during the March 2009 Nationals. I was the only non V8 left in the last 8 cars in round 4. Round 5 of the off street racing against "W ZONE", a 1986 Mazda Rx7 running a Lexus (aka Toyota) 1UZ (b&s to 4500 cc) supercharged V8. He has previously run a 10.563 at 130 mph at Mere Mere during the March 2009 Nationals. This was my closest race as this V8 matched my launch off the line which none of the other V8s did. See the right hand inset picture above taken one car length after the start of the race. 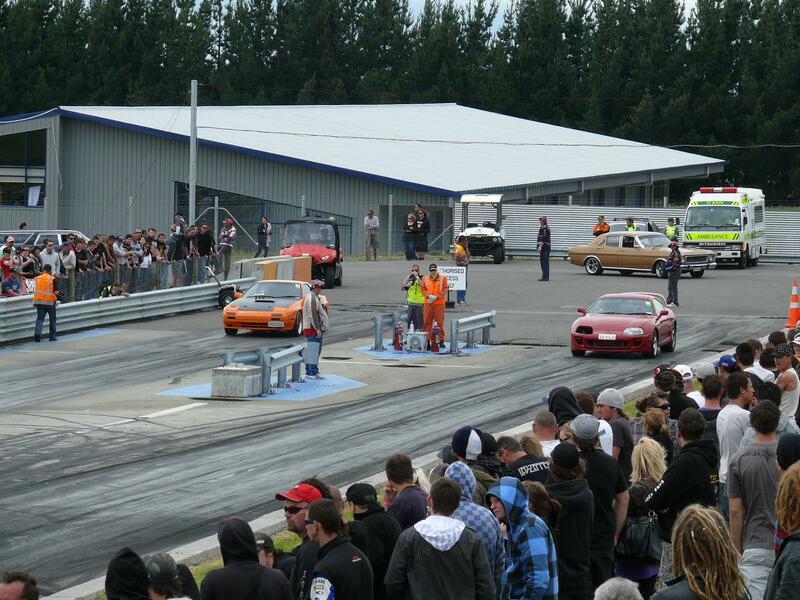 On viewing the video on the NZV8 TV show on Sunday 29th Nov on TV1, I won this race by around 2 car lengths (about 0.2 sec). 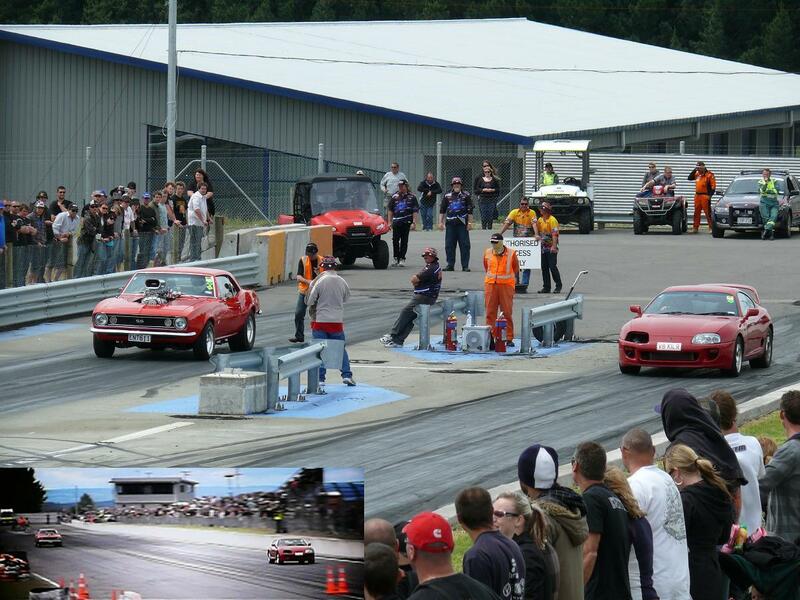 Round 6 of the off street racing against "ENT611", a 1967 Chevrolet Camaro with a 502 CHEV (8226 cc) supercharged V8. He has previously run a 10.622 at 124 mph at Mere Mere during the March 2009 Nationals. 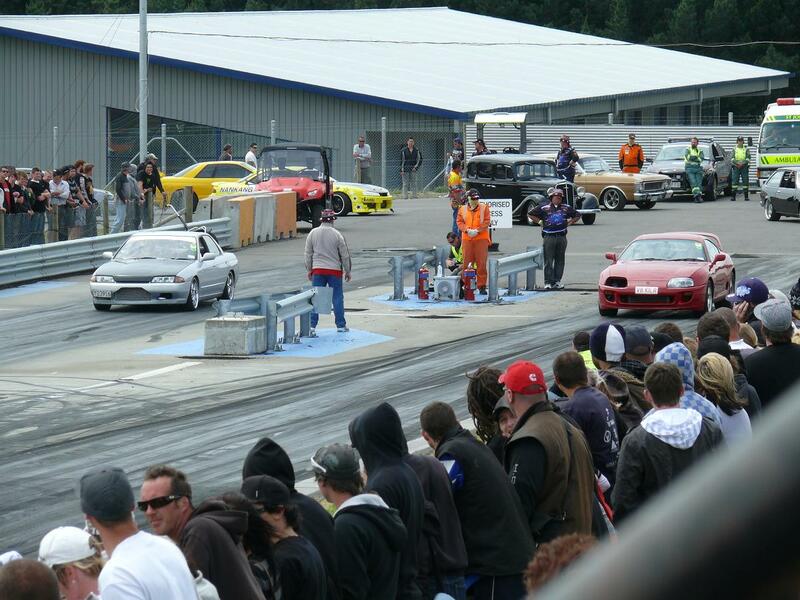 This was the finals of the Off Street racing so I won the Off Street event with this race. This was an easy win as he bogged on the line and then wheelspun trying to catch up. Check out the NZV8 TV show video showing the Power skids in the first half of the video and then me beating the V8s in the Off Street racing in the second half. Outside dyno competition waiting to go on the dyno. On the dyno rollers waiting to be strapped down. Dyno competition power run. I got 460 rwhp on dyno dynamics but dyno was reading low. Still it was the same for everyone and that run was good enough for me to be the 6 cylinder winner. 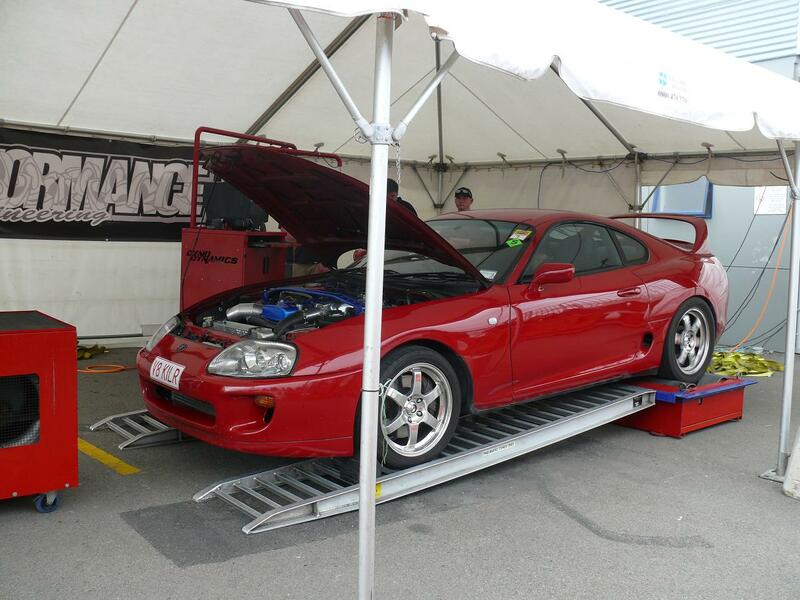 I had 407 rwkw with 720 nm of torque (545 rwhp with 531 ft/lb of torque) on same type dyno two days before in Auckland with the same boost settings.